It is acceptable to dedicate an entire post to shoes, right? I think so. Especially when those shoes happen to be beautiful Christian Louboutins. A few months before the wedding my mom and dad surprised me with the best wedding gift ever- a pair of Christian Louboutin pumps to wear on my wedding day. The day after I received them I wrote a post about the gorgeous shoes and left everyone hanging as to what they looked like. I raved about the beautiful shoes on the blog and throughout the social media world, but I let very few people actually see them. Just like my dress, I wanted them to be a wedding day surprise. By the time our wedding day rolled around, many people had heard about the shoes, but only a handful had seen them. Needless to say, I was thrilled to show them off to anyone and everyone who asked about them during the wedding reception. 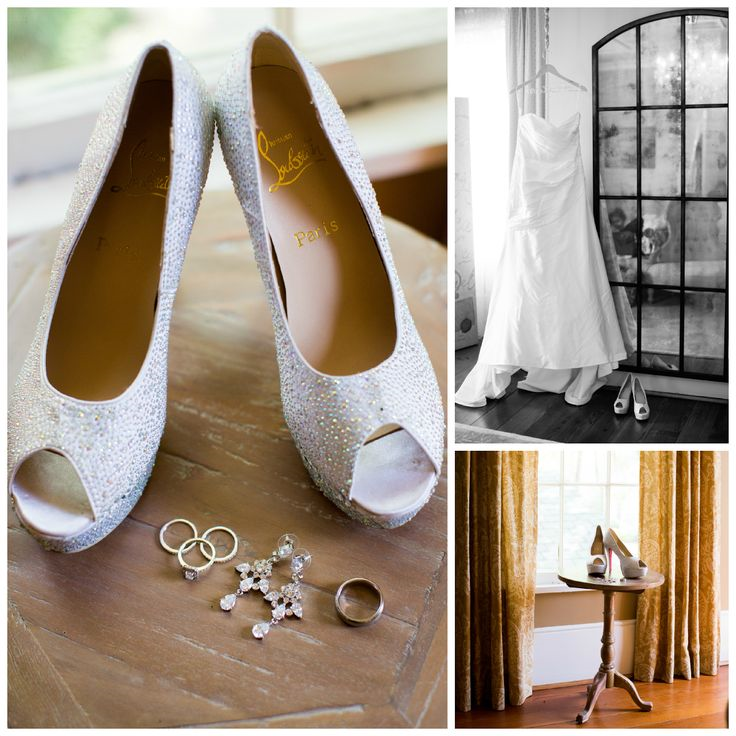 I kid you not when I say that our guests were just as excited to see the infamous wedding shoes as they were to see the dress that I had also worked so hard to keep secret. I knew by the end of the night that my feet would be killing me from standing (and dancing, lots of dancing), but I was determined to keep them on my feet as long as possible. Unfortunately they did not stay on my feet the whole night. The dancing was just too much! They were, however, the perfect shoes for my wedding day. They gave my dress that extra little sparkle, and the red soles popped against the white dress. I can't thank my mom and dad enough for this beautiful surprise and for giving me the wedding of my dreams. I am now in the process of decorating an entire room in our house around these shoes. Thanks to Pinterest, I found the perfect way to display them in a case, and I am turning the beautiful pictures that our photographer took of them into canvas to hang on the walls. It's going to look amazing when I'm done! Because after all, these shoes are way too pretty to sit in the back of a closet somewhere! Fabulous!! Now start planning your 1 year anniversary outfit around these shoes!!! These shoes are gorgeous! Ever since you wrote that post about getting those shoes I was so intrigued to find out what they actually looked like!! What a fun addition to your wedding day! I can't wait to see how that room turns out! They are so gorgeous! I only wish I could wear shoes like that for more than 2 minutes :) And I love your idea of doing a whole room with them as the center piece... very crafty of you! I am obsessed!! 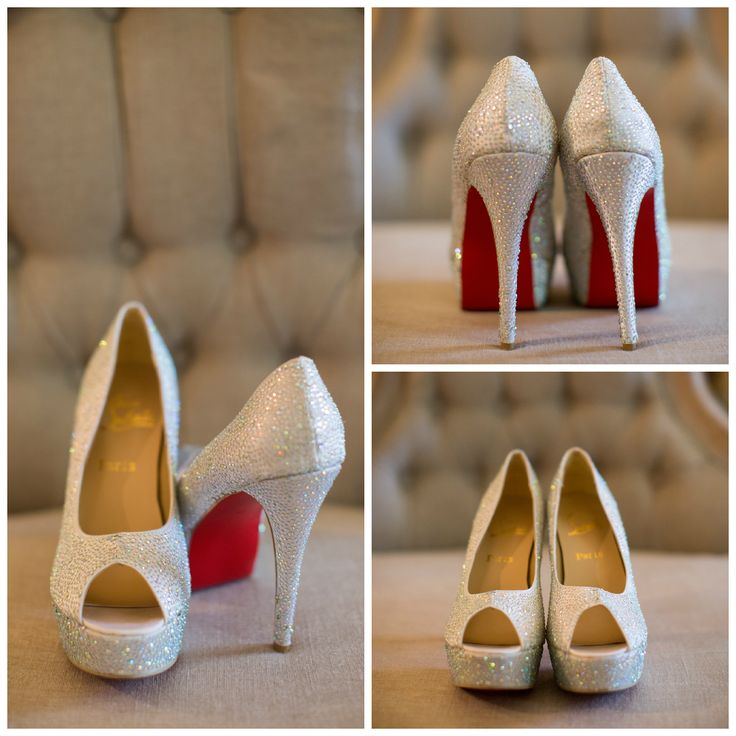 I adore Louboutins and these are the perfect pair for such an amazing wedding. That was very sweet of your parents to gift you such amazing shoes. oh and I would love to see the pin, you referred to. I hate the idea of storing my shoes away! Stunning!! And yes, agree about the first anniversary too :) And shadowboxes! I just wrote a post for next week about what I did with all my wedding stuff and almost everything went into shadowboxes. These are seriously so perfect and SO you! Fabulous!! Those shoes are absolutely beautiful!!!! I would be planning a room around them too! They are so gorgeous!!! A room dedication is a MUST! ahhh so gorgeous!!! can't wait to see how the room turns out too! Best wedding shoes EVER!!! Seriously your mom and dad rock! WHAT! They are gorgeous! You should wear them for your Anniversary dates every year to remember your special day!